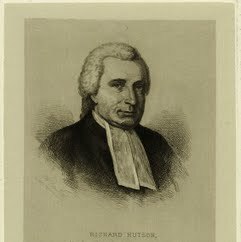 Richard Hutson was an American lawyer, judge, and politician from Charleston, South Carolina. He represented South Carolina as a delegate to the Continental Congress, where he signed the Articles of Confederation. After the British captured Charleston in 1780, he was held as a prisoner at St. Augustine, Florida for a time. After he returned home, he served as the eighth Lieutenant Governor of South Carolina under Governor John Mathews in 1782 and 1783. On September 11, 1783, Hutson was elected the first intendant of Charleston, South Carolina. He was re-elected on September 13, 1784, by a vote of 387 to 127. Born in Beaufort County to Rev. William Hutson and Mary Hutson, he moved to Charleston with his family in 1756. The Pennsylvania Gazette of October 10, 1765 lists him as a member of the graduating class of 1765 at Princeton University. He is buried in a vault at the Independent Congregational Churchyard in Charleston.